As one of their local initiatives, Gorham invested in pitched roofs to be consistent with a their residential area and village aesthetic. PDT used a mix of hand renderings and computer videos to convey the design intent to the client throughout the design process. The built-in story area faces rolling bookshelves that can be moved to create privacy and reading alcoves. Natural light bounces off the ceilings, with sensors automatically adjusting the amount of artificial light. The lobby doubles as an art gallery, display space, queuing area for bus pickup, and a community space for food drives and bake sales. The site is adjacent to protected conservation areas and was fully developed with mature trails and athletic fields. Project rooms at the entrance to each house provide tables, storage, water, and refrigeration for “wet” science, art, and food projects. After a three-year search, the Building Committee located a rural site that would provide for town water and sewer and underground voice/data utilities. The 23.5-acre parcel is historic farmland adjacent to protected conservation land. The school design responds to view corridors, solar orientation, and an existing residential neighborhood. The academic classroom wing separates the student population into five small learning communities, three on the first floor and two on the second. The learning communities are oriented around the school library, which has access to a wide outdoor courtyard. The school library and the PK/kindergarten classrooms form the heart of the academic learning communities. Each learning community has its own "educational commons" for exploratory projects related to science, ecology, and the arts. 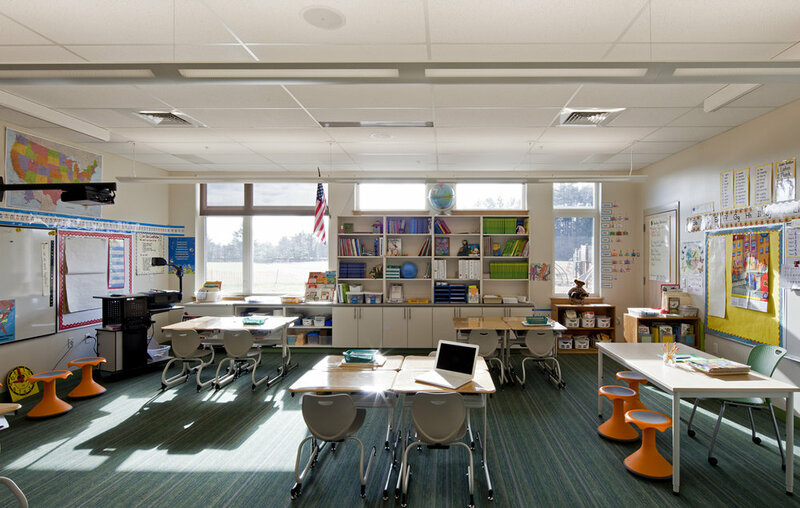 The building consciously maximizes northern and southern orientation for daylight harvesting for all classroom areas. This high-performance school incorporates automatic daylighting controls, geothermal ground source heat pumps, solar hot water vacuum tubes for domestic hot water, CO2 on-demand ventilation, and a high-performance building envelope with air barrier system and extra insulation. The community's desire for a building with extensive pitched roofs gave us large attic mezzanines, to allow mechanical equipment to be brought indoors, where it is protected from the weather and reduces noise transmission.